Now Available Fish the world famous Gordo Banks, just outside of the new Puerto los Cabos Marina. Fish out of the new Marina in San Jose del Cabo "Puerto los Cabos". 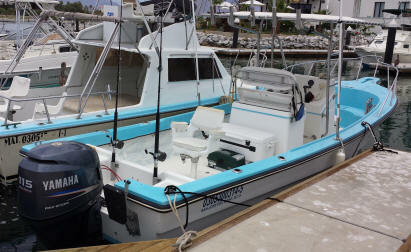 Now available - Fiesta Sportfishing is fishing out of San Jose del Cabo. If you are staying in San Jose del Cabo consider fishing with us out of the new Marina, most resorts in San Jose are only 5-10 minutes away from Puerto los Cabos. Just 10 miles outside of the Marina is the world famous Gordo Banks, where you will be fishing for Blue Marlin, Striped Marlin, Sailfis, Tuna, Dorado & Wahoo, along with great inshore fishing for Roosterfish, Sierra, Pargo, Jacks & more! "Lets fish- Join us Today!" Puerto Los Cabos Super Panga "Kika"
Fishing out of San Jose del Cabo Marina "Puerto los Cabos"'. Newer Super Panga , equipped with Penn International. 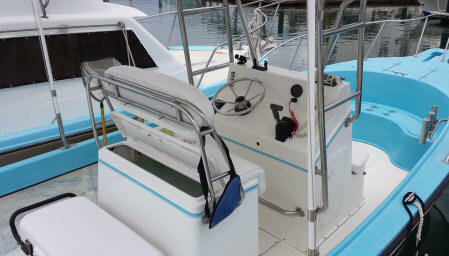 & Shimano Gear, outriggers, Center Console with T-Top shade and rocket launcher pole holders, live bait tank, forward seating in front of the console, rear fighting chair, VHF, large ice chest, new technology Yamaha 4 stroke engine is fast & quiet, this boat will get you to the fish fast without spooking them! Captain "Jorge" is one of Puerto los Cabos most productive Captains! 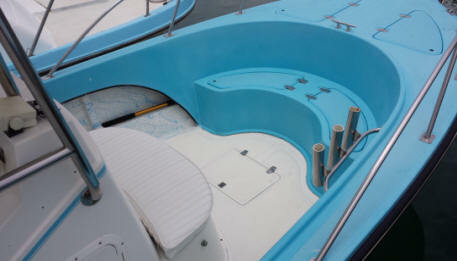 This is one of our most popular Super Pangas, so book early for a chance to fish on the "Kika" with Skipper "Jorge". Includes: Experienced San Jose del Cabo Captain, Penn International and Shimano reels, wide selection of lures including trolling lures for Marlin, Dorado & Tuna plus smaller lures for Sierra, Skipjack, Tuna, Roosterfish and more. Super Panga, fuel, skipper, all Penn Intl & Shimano fishing gear & tackle, 16% tax, one block of ice, dispatch fees & dockside bilingual departure/arrival assistance. 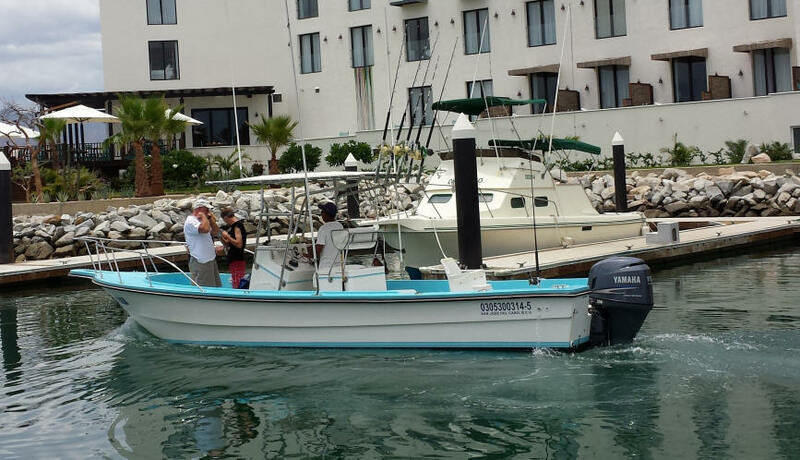 Over the past 21 years our Cabo fishing clients have enjoyed the family hospitality of our fleet in Cabo. Now you can enjoy that same hospitality while in San Jose del Cabo fishing with us out of the new Puerto los Cabos Marina. Join us on your next trip to experience the tranquility of Old Mexico with some world-class sportfishing in the Sea of Cortez.! Prime seasons are Spring through early Fall. 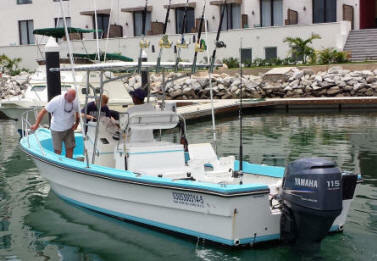 Call or e-mail us to set up a Fiesta Sportfishing package for your trip or group to the new Puerto los Cabos. Fiesta Sportfishing is one of the most experienced in Cabo & San Jose del Cabo. The crews from the boats picked above live & grew up fishing the Gordo Banks & surrounding areas of the Sea of Cortez & San Jose del Cabo Area. If you are staying in San Jose del Cabo and want to fish the world famous Gordo Banks we will bring our boats to pick you up in the new Puerto los Cabos Marina. Gordo Banks is only about 45 minutes just out side of the new Marina and about 1.5 hours closer than from Cabo giving you 2-3 hours more fishing time! Advanced reservations are required. Above Puerto los Cabos Super Panga charters include: fishing 6 hours approx 7am-12 pm, the boat & Skipper meeting you at Puerto los Cabos, La Playita Marina, boat, fuel, crew, tax, tackle & gear, and dockside departure and arrival assistance. Extra; food, drinks, live bait (when available), fishing license, extra ice, fish cleaning, and crew gratuities.